I spent way too long agonizing over a headline ("Real life Brienne of Tarth" or would it be better to say "Brienne wishes she was…"? 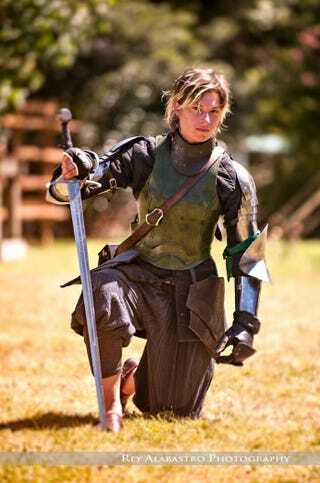 Or maybe just the facts "World champion swordfighter…" Wait, does this tournament actually make her world champion? Once scores were weighted for the other events, she didn't score that highly. The original headline is long enough that Kinja is showing me a very large, red number when I try to enter it. "Badass pro-swordfighter" it is, then…) Suffice to say, this is pretty awesome, even if I missed a lot because her accent was throwing me. There's an interview with her after the link. I'm too American to try to guess what her accent is (though, the tournament is in New Zealand and she seems to pretty tight with Weta Workshop. Is it a New Zealandian accent? How incorrect is "New Zealandian Accent"? ), but it's thick, so I think I lost probably about a third of the interview. What I understood sounded pretty cool though. Anyone got any tips on relevant tags for this post that have actually been used on Kinja in the past?